Amongst the midrashim about the Akeida, there are descriptions of Avraham's strict adherence to the details and halachos of how a korban must be brought to Hashem. Yet when Avraham was not able to use the knife to slaughter Yitzchok, before he was stopped by an angel, he began to strangle his son in a last minute attempt to fulfill what he believed was Hashem's will. In the midst of strangling his Yitzchok, he said to himself, "Obviously, Hashem does not want me to kill him by cutting his throat. He must want me to kill him with my bare hands." Is this midrash an example of Avraham Avinu following the logic of his own mind rather than adhering strictly to what Hashem actually commanded? Isn't this the same thing that Hashem faulted Nadav and Avihu for? I would say no, and very shortly: Avrohom Avinu was the first fundamentalist Jew. We spoke about it a little here. Avrohom wasn't one to consider taking an alternative way around G-d's desire - that's the entire point of the test of the Akeida in the first place. G-d told Avrohom that he should be makriv Yitzchok. It wasn't ambiguous. It wasn't misunderstood. Avrohom took it seriously, and he was undaunted by the obstacles that got in the way. The same was true when he got to this point, and the fact that some angel told him to skip it was really just another test. 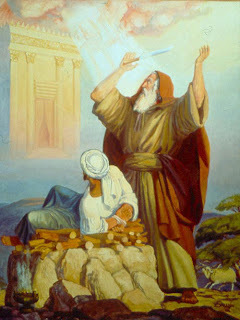 Avrohom could no longer use a knife, that's true, but G-d didn't mention knives; since the initial order came from G-d, any cease and desist order would also have to come from G-d. Therefore, it must be that an alternative means, other than a knife, was to be used.